If you’re not completely immersed in one ecosystem (and chances are you aren’t) - the Innergie Magic Cable Trio will possible be one of the niftiest accessories you can get. And by completely immersed we mean everything from cameras to your MP3 player to your phone and eBook reader. In virtually all of those cases, the Cable Trio will have you covered whenever you need a USB to microUSB, mini-USB or a 30-pin Apple connector. You just daisy-chain the cables into a single cable - much easier to carry around. The best thing about it is that it costs only $19.99. The Magic Cable Trio is made carries the “Made for iPod, iPad and iPhone” stamp and is available now. Hit the source link below if you’re interested. 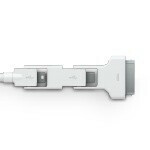 FREMONT, Calif., Nov 30, 2011 (BUSINESS WIRE) -- Innergie, the world's leading provider of innovative consumer power solutions, is introducing two new power cables that are certified for use with all iOS portable devices including iPad, iPhone, and iPod, as well as more than 10,000 other portable devices with USB connections. Innergie's unique Magic Cable Duo and Trio provide consumers with the only portable charging cable they will ever need for all their portable electronic devices. In addition, Innergie is introducing three distinct Charging Kits for powering devices at home, in the office, in your car, in the air, or just about anywhere else life takes you. Magic Cable features a convenient, integrated multi-tip design to charge and synchronize any number of electronic devices including Apple's entire line of portable iOS devices, Android and Blackberry Smartphones, and virtually any other device that uses USB as its power connector. The Magic Cable Duo integrates a certified Apple tip and Micro USB tip in one cable, while the Magic Cable Trio provides an additional Mini USB tip to charge digital cameras, MP3 players, and a variety of portable GPS devices. "Innergie's Magic Cable Duo and Trio power cables are the only power cable solution consumers will need to charge nearly every portable device they own, including their iPhone, iPad, and iPod," explains Tom Atkinson, Senior Director of Americas at Innergie. "The Magic Cable Duo will also be included in Innergie's new Charging Kits, which allows devices to be charged at home, in the office, in the car, on the plane, or anywhere consumers travel. Customers will never have to worry about carrying multiple individual power cables and adapters for each device. The Innergie Charging Kits with Magic Cable Duo, are lightweight, compact for added convenience, making the kits ideal for people on the move." Innergie's Magic Cable Duo will also be included in a series of new Charging Kits designed to provide charging capabilities for today's mobile consumer. Innergie power products are designed to offer customers the best balance of performance, reliability, and compatibility to deliver energy efficient power adapters that reduce power loss, use less power, and do not impact the battery life of a consumer's portable device. not sure why it took someone so long to make this. I have too many cables. This would relief alot of clutter for many people. I carry 2 cables in my backpack.. one micro USB for my phone, and a spare iPod cable because my kids keep losing theirs. This cable saves me almost nothing.. but gives me a HUGE connector. For $20?? No thanks! I can order the USB cables for a couple dollars on monoprice.com and keep them at work, in my computre room at home.. blah blah.